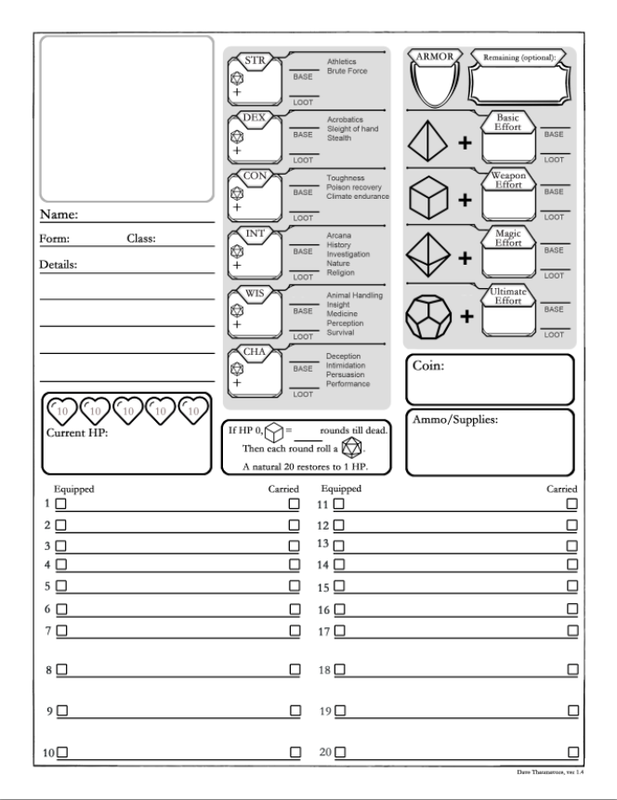 Dave's Character Sheet ver 1.4! 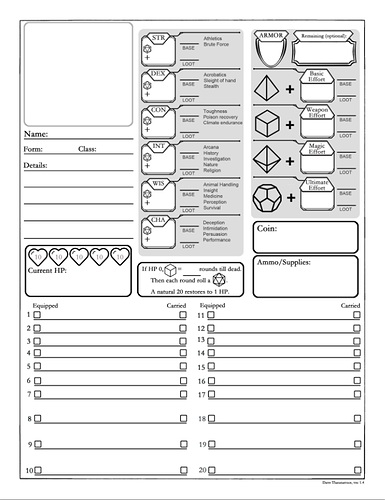 I stole Dave Izm’s character sheet ver 1.3 and made a 1.4! Sweet! The forum needs a char sheet section. I really like it it’s got a nice old school look to it. The breakout of the skills called out by the main stats. This makes it super compatible with more detailed RPGs! The extra space for item descriptions. In fact, I’d like to see more space for all item descriptions even if it cut the number from 20 to 10 to make it work. I also like that I can fold it in half to save space and then flip it over when I need to remind my self of what an item is doing. This is great if I’m running multiple characters and want to save on table space. There’s so many great character sheets I’ve seen throughout this forum. But at the moment this may take the cake! Someone make this happen. STAT! Yes, idea of having section for char. sheets will be good. We should group them and expose more. I love your character sheet, Dave. Where do rapiers fall, though? D6 or D8? If you flip the sheet over, I list every weapon in the game along with its damage die, damage type, range, weight, size category, rareness, cost and resale value. Clicked the link but only had 1 page. Is there a link to the back of the page? Heh, nah, I was just poking fun at more rules-heavy games. However, my character sheet HAS recently picked up a second page. It’s for an upcoming ICRPG supplement. I’ll release it after some playtesting and after the supplement of course has been released.